A deformed man wrapped in bandages and rags rises from a swamp, pontificating on his own monstrous appearance. He decides that it is getting too cold to stay in the bog, so he heads toward a neighboring abandoned, ruined factory to prowl the corridors. As a monster, he knows that everything fears him. Everything except the thousands of rats that infest the ruins, that is. Outside the perimeter of the factory, the Turtles and Casey have decided to investigate the place for kicks, hearing stories that it may be haunted. Their noisy arrival awakens the monster, who sees the Turtles as other monsters competing for his property. In his lunacy, he decides to make sure they fail. 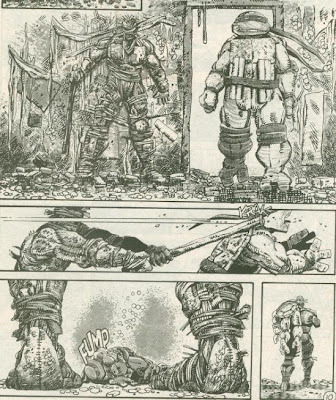 As Mike wanders off alone, the monster whacks him over the back of the head with a pipe, then drags the unconscious Turtle to a secluded room and straps him to a table. After screaming and ranting at Mike like a madman, the monster decides to leave him to the mercies of the rats. As he leaves, the monster considers that he’d never killed anyone before and that he is finally transcending from a man playing a monster to the real thing. Meanwhile, Mike sees hundreds of rats pouring through the wall toward him. Using all his strength, Mike breaks the straps on the table and frees himself, though the rats overwhelm him by sheer numbers. Luckily, his brothers and Casey arrive in time to ward the rodents off and they all go chasing after the monster. The monster leads them into a roofless, circular old brick building and, from the safety of the top ledge of the wall, slams and locks the doors shut behind them. The monster announces that he’d been leaving dead and dying animals in this room to feed the rats in a fruitless effort to befriend them. The Turtles and Casey are their next meal. Thousands of rats begin pouring in, but no matter how many they kill, the vermin just keep coming. Mikey finally has enough and smashes through the old brick wall Kool-Aid Man-style, allowing the others to follow him to safety. Leo immediately hurls a shuriken at the monster, planting the throwing star directly in his chest. The monster falls from the considerable height of the ledge and into the circular building, where the rats below can be heard swarming him. Mike considers going in after him, but Don assures him that there’s nothing more that they can do. As the sun finally sets, the Turtles and Casey leave. Inside the building, the monster sits sullenly, surrounded by several friendly rats. He repeats to himself that he is the Rat King and that everything fears him. Everything except the rats, that is. 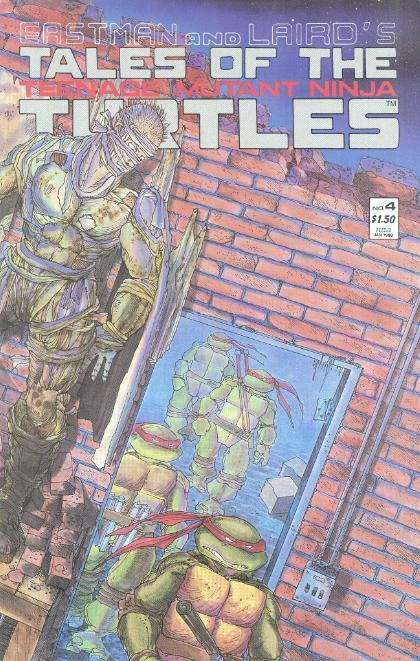 *This story takes place during the time the Turtles spent exiled to Northampton, before TMNT (Vol. 1) #19. *The Rat King’s Origin will be explored in Tales of the TMNT (Vol. 2) #35. *Casey’s love of spray paint art was previously established in “Fun With Guns”. *The Rat King will return in TMNT (Vol. 1) #55. *For the Tales of the TMNT Original Vol. 1 Series Treasury Edition trade paperback collection (whew! ), the original frontispiece was swapped out with a new one by Jim Lawson, tying into a larger story arc going through all the new frontispieces created for that collection. *This issue was adapted for the 4Kids animated series into the episode, “I, Monster”. *This issue also contained a pin-up page by Butch Adams. This is by far one of my favorite Turtle comics and comes so close to taking the cake as my all-time pick, too. It’s just such an incredibly well-crafted, well-paced and well-written horror story, with a mysterious villain, an eerie setting and lots of gruesome imagery. This is Jim Lawson and Ryan Brown at their absolute best. The story is told almost completely from the point of view of the Rat King and you get lost in his mania as the story progresses. For a guy with no origin, you’d think he’d be a rather shallow enemy, but the inner monologue that he provides actually fleshes him out to a fascinating extent. The dude’s just plain crazy and thinks that he’s a monster. Well, for the moment, anyway. Previously, he thought he was a ghost, but decided that was old hat and changed his persona. He isn’t an “actual” monster, but a guy dressed up in bandages and rags who thinks he is, and in a way, that makes him a “real” monster. He even considers this when he’s about to kill Mike; that murder is what is necessary for him to make that leap. And yet, despite following him and getting into his head as the main character of the story, the Rat King doesn’t cease to be frightening, thanks in large part to Lawson’s really freaky design for the character and Brown’s ferocious inking. The ending of this issue is wonderfully complimented by the Rat King’s next appearance during “City at War”, where we find out that he didn’t survive the fall. It gives that final splash page this spectral quality, as it may very well be the Rat King’s ghost sitting on the floor of the room, surrounded by Rats. In life, he could never befriend them no matter how hard he tried, but in death he succeeded. 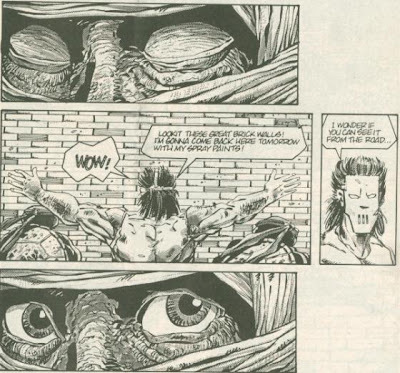 The Rat King’s subsequent appearances, as a mysterious spirit guide to Splinter would make him one of the most fascinating and eerie returning characters in the Mirage comic, enhanced by the fact that he was utilized very sparingly. Of course, an ill-conceived origin was created for him in the second volume of Tales of the TMNT which I absolutely do not care for. I’ll save my thoughts for that review, but the fact of the matter is, the mysterious and unknown quality of the Rat King is what makes him so disturbing and attractive at the same time. You can come up with a million different origins for this guy in your head and any one of them will do; a concrete back story robs him of his mystique. Personally, I choose to ignore that issue of Tales of the TMNT (Vol. 2). I’ve said before that the first volume of Tales of the TMNT is my absolute favorite era of Jim Lawson’s work. His style is more rounded-off and detailed and the inks and tones from Ryan Brown really give it an edge. This issue, especially, showcases how good Lawson is at drawing gritty, dilapidated architecture. The entire maze-like factory is just this wonderfully horrible setting; like the labyrinth of the Minotaur. I absolutely love it. Ryan Brown’s editorial intro to the issue features a rather descriptive anecdote about his time in Cleveland and what inspired the factory setting of this story, and the guy paints a rather spooky picture. The only real problem with this story is the lettering by Steve Lavigne. The dude messes up a LOT of speech bubbles. On page 6, Don’s lines are attributed to Raph (and they sound really out of character coming from him), Mike responds to his own observation on page 9, and I’d like to think that Raph’s line on page 23, “This smells of a trap”, was meant for Leo, because that just doesn’t sound like something Raph would say. The lettering errors are unfortunate, as they bring what would otherwise be a totally flawless issue down a hair of a peg. But even considering those errors, this is still my favorite issue of Tales of the TMNT and one of my favorite Turtle comics period. The 4Kids cartoon’s adaptation was really damn good, too, and I would recommend it to anyone. It changed a lot of things, chief among them the nature of the Rat King. And yet, despite my earlier criticisms, I thought the origin they gave him in the cartoon actually fit well with their adaptation of this story and the show's ongoing narrative, so it didn’t bug me so much. 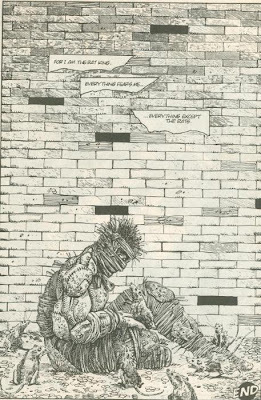 Whatever version you go with, this is one of the best TMNT stories ever told. great issue indeed! great character, great scenery and ambience and a bitter sweet ending (those are the best really). and for the tales origin, i only recall that i didnt like it. too much magic and fantasy in the wrong place maybe? something like that. changing subjects: read your reviews at "adventures in poor state!" about batman, tmnt and tiny toons. and i was surprised about the latter. i'm of those folks that thinks it was a really good show...:S i'm confident in your critics sense but still want to try by myself. someday i'll have to watch it again (but thanks for the heads up haha). Thanks for reading! Especially my AIPT articles. In regards to Tiny Toons, I found after revisiting it on DVD that it was a show with some stellar highs, some god awful lows and a LOT of mediocre in between. The show is worth it overall for its good episodes (which are fantastic), but the bad and average really hurt it in so far as rewatching it as a whole is concerned. It's definately a show best reserved for cherry-picking the top episodes and leaving the chaff behind. I recently became obsessed with The Rat King and his "secret" origins. So glad to stumble upon your site in the process! I kinda dig the grungy simplicity and availability of the original cartoon appearances, but man. You cannot go past the creepiness of the comic book original! Many thanks for having such a great review and info source for TMNT fans! It's great to be able to reach back into the past and soak up the weird and wonderful world of the comics! Cheers! Thanks for the feedback! Rat King's a pretty versatile villain and no two versions are the same, but the trappings are really what make him standout amongst the TMNT's rogues gallery. Take it easy!